As I mentioned in the main pond pump article on the homepage, one type of pond pumps are solar powered pumps. While going green and being able to run the pump without any operation costs for electricity, there some aspects you have to consider before getting a solar unit. Solar pumps are powered by solar panels and due to the power required to operate the pond or fountain pump, these panels are not exactly small. So, you have to consider how your garden would look with such panel. The panel will have to be placed in such place where it gets a lot of sun, preferably facing south. If it’s not placed in a proper spot, the pump will not reach its full performance limit. Even the best solar pumps are not as powerful as their non-solar counterpart, therefore they are more suitable for smaller ponds, and they are mostly designed for fountain usage. Another thing to think about is the night operation. Normally, a pump will work non-stop 24/7, but solar pumps cannot operate during the night. They either need a battery or line connection. For some setups non-continuous operation is not a problem, however if you have fish in your pond, it’s preferable to let the pump run during the night. Here you can find the top 4 best selling models for 2019. These models can be further divided into two kinds – one will have an external solar panel attached to a pole or similar structure on the ground; the second one will have built in panel which sit on the surface of the pond. The first version is the most popular solar pond pump type, mainly thanks to its easy installation, low noise and ability to serve medium to larger sized ponds. The second version is meant for smaller ponds because it usually has a small solar panel which will not provide enough energy for big ponds. I personally don’t like the thought of having a solar panel floating on the surface of my pond. The external solar pumps function pretty much the same way as traditional external units with the only major difference being the source of power. The external units are bigger than the submersible ones, and they can handle much larger masses of water. External units are somewhat more difficult to install due to the additional piping involved, but once they are installed, they are easier to maintain than the submersible pumps. Now that we’ve gone through the pros and cons of the various pump types, we will take a look at some of the most popular and best rated solar pumps. 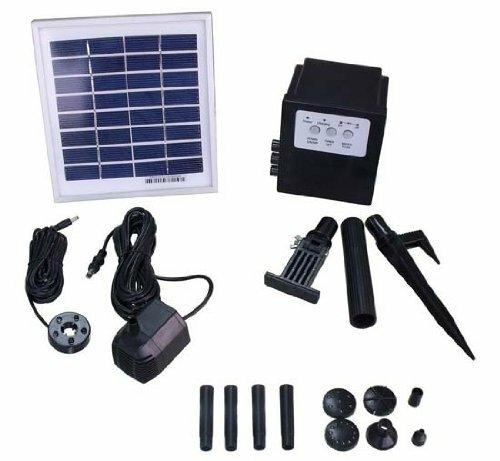 If you are looking for the top rated solar powered water pump for your pond, then this is it – the Ambiente Remote Controlled Solar Water Pump Kit. It is a rather small pump with a 3W solar panel that can be remotely controlled during the day and night use. The pump is designed for usage in fountains, garden ponds, and other garden waterworks. The submersible pump comes with led lights, which are used to make the fountain stream colorful, and they can be switched off. Due to its low power of 211 GPH, the remote controlled solar pump is suitable for smaller ponds. For those of you who need 24/7 operation, this pump is not a good choice because it runs, then it stops running to recharge the battery and then it starts running again. This is, however, the case with most of the solar powered water pumps. 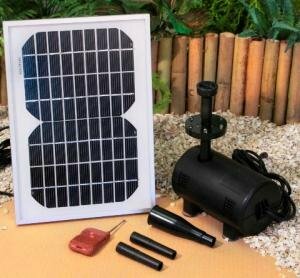 This solar powered pump kit is one of the best-rated kits on the net. Some of the users mentioned that the pump requires frequent maintenance when it’s placed in a pond with fish. Other customers praised the kit for its easy usage and setup. Click here to buy the Remote Controlled Solar Water Pump Kit on Amazon! Here we have another 3 Watt solar powered submersible water pump with batteries and LED lights. This time, it’s slightly less expensive than the Ambiente model. The operating time of the pump can be pre-set by the user, and the internal clock will then turn the pump on and off automatically every day. The LED lights will automatically illuminate the fountain spray during night time operation. Compared to the first features model, the APP012B is considerably less powerful with estimated max water flow of 80 GPH. Therefore it’s suitable only for smaller bodies of water. The primary usage is, of course, as a pond fountain pump which will aerate the water. The maximum lift of the fountain is 4 feet. Even though the kit comes with back up batteries which are charged during the day, the pump will most likely not operate during whole night. A reasonable operation time to be expected is between 3 to 8 hours, depending on the water flow, charging time, and sun exposure during the day. Included in the kit are batteries, a 3W solar panel with supporting spike, fountain light, 3 different fountain heads, control system, and of course the pump itself. Customer reviews are not as favorable as with the previous model. The kit, however, still belongs to the best-selling pond pumps. Click here to buy the Garden Sun Light APP012B 3 Watt Solar Panel with Water Pump on Amazon! As a third choice, we have a pump that is meant only for the smallest water features or as an addition to a pond which is already served by a more powerful pump. The pump in question is a solar fountain pump designed to look like a floating lily. The solar panel is built into the lily leaf and therefore it doesn’t spoil the looks of the landscape near the pond. The pump doesn’t have any on/off switches and will run continuously when submerged in the water and exposed to the sunlight. There are no backup batteries, therefore it will not run during the night. I would personally consider the product as a beautification for a pond with existing water movement functionality. With its power of mere 30 gallons per hour and noncontinuous operation, it shouldn’t be considered as the main pump for bigger ponds. On the other hand, it will make the pond more interesting and pleasant to look at. The average customer rating of the kit on the net is not high, but it still has its fans. Most people praise it for the added ambiance. 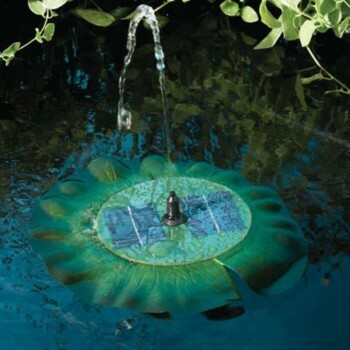 Click here to buy the Floating Lily Solar Fountain 24402R01 on Amazon! If I was to make a decision, I would personally use a solar pump only for smaller ponds without fish. The solar pumps are perfectly capable of taking care of the needed water movement for smaller ponds, however, the fish life could be endangered because of the hampered night operation. Continuous operation is important for healthy fish, especially the Koi carps.